Dogipot introduces the Aluminum Dogipot Header Pak Junior Bag Dispenser to hold Dogipot's new line of Oxo-Biodegradable Dogipot Header Pak Litter Pick Up Bags (i.e., hanging litter pick-up bags). These new items give customers more choice, and the Header Pak bags will fit all major brands of hanging bag dispensers. Dogipot offers high-quality, environmentally conscious products to help keep your dog-friendly areas free from unsightly, smelly and harmful dog waste. UltraSite launches new dog park kits and products for smaller dogs. Choose from two kit options that feature commercial-grade canine agility products tailored to smaller breeds. Each kit includes the new Small Dog Hoop Jump, which was designed to meet agility jump height classifications determined by the American Kennel Clubs for smaller breed dogs. It's perfect for agility training or just for fun. Whether starting from scratch or putting the final touches on your dog park, Dog-ON-It-Parks is your source for affordable, pet-friendly solutions. Dog-ON-It-Parks knows dogs, so its products are designed to be safe, fun and extremely durable. With a wide selection of dog agility components, pet fountains, site furnishings and more, plus expert guidance to help you along the way, there's no reason to look anywhere else for your dog park needs. 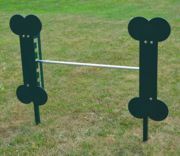 To assist in agility training, Jamestown Advanced Products offers a full line of dog park equipment, including the Adjustable Dog Bone Jump. Jamestown offers customization options and colors—including blue, green, gray, black and white—for all of your park and campground needs. With five height adjustments that adhere to AKC specifications, dogs and their owners will be thrilled! Thanks to Jamestown's expertise in handling steel products, it is able to produce top products that are extremely competitively priced. ParknPool's selection of top-quality dog park equipment will ensure that your dog playground will definitely be the "bark of the town." Keep your pets' environment as clean as possible by placing pet waste stations around. Exercise is a great outlet for pent-up energy and will help avoid unwanted behavior some pets display due to lack of exercise. Accent your dog park or other pet designated area with Bark Bench. This dog-themed, bone-shaped bench is manufactured using high-strength pre-cast concrete and comes with a 15-year warranty. Bark Benches install with ease as they can simply be dropped into place. Make any space more fun and pet-friendly. Don't forget to take advantage of customizing your Bark Bench today. The high/low pet fountain, Stern-Williams' Model 9002, is being featured here. But, many more new pet and drinking fountains combinations are now available. Choose the most appropriate one for you, and Stern-Williams will make it a reality. All of Stern-Williams' metal fountains are offered in powder-coat or stainless-steel finishes. Stern-Williams' goal is to satisfy the thirst of both your visitors and their pets.